The archaeological museum in Zagreb has many valuable remains from prehistory to the High Middle Ages. The Egyptian collection is one of the most interesting collections of the museum, and in its century and a half of existence it gathered many artefacts. 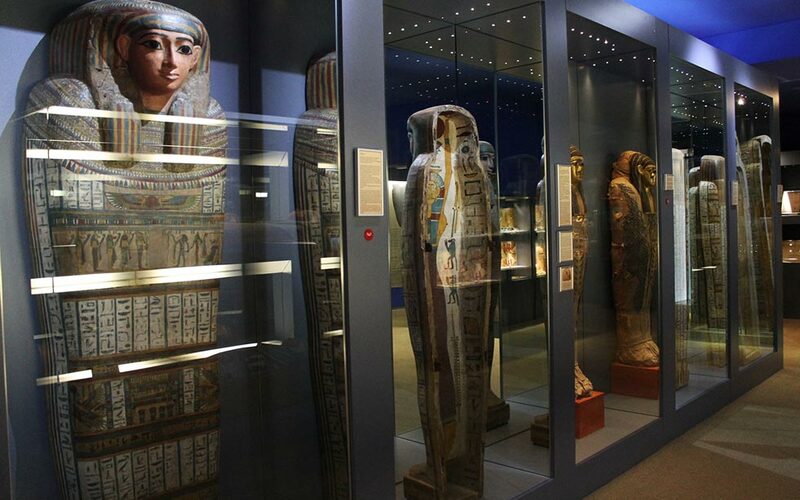 It is based on the so-called Zagreb mummy and its wrapping and a large collection of Egyptian art that was bought from the family of the Austrian baron Franz Koller in the middle of the 19th century. The "Linen book of Zagreb" (Liber linteus Zagrebiensis), a manuscript with the longest preserved text in Etruscan language is the only remaining Etruscan text with literary characteristics and the only preserved sample of a linen book from the old ages. The canvas with about 1130 words has been preserved in five subsequent strips. The length of the entire book is about 340cm and width of the strip is 35cm. The so-called Zagreb mummy and its wrapping are a world rarity. Its finding maybe proves the possibility of a stronger communication between Etruria and Egypt. The origin of the mummy is still mysterious. It is almost certain that it comes from Egypt but still not clear why the text is written in Etruscan. It is assumed that a community Etruscan refugees lived in Egypt and adapted some Egyptian customs ( like mummification). The mummy arrived to Zagreb between the 22nd and July 25th 1862. The shipment from Vienna consisted of the linen bandages, a very damaged Book of the Dead of the deceased and her husband, balm, remains of a funeral wreath of leaves and flowers, tiny fragments of wood and stucco from the sarcophagus, blue-green beads that adorned the mummy and a head of a mummified cat. In 1869 the famous German Egyptologist Heinrich Brugsch visited Zagreb and was invited by the former museum curator Sime Ljubic to review and organize the collection of Egyptian art, which in the meantime was increased by the purchase of the whole Koller collection. The result of the first Brugsch's research was the first list of artefacts based on which Ljubic released the first catalogue of the Zagreb Ancient Egyptian collection. When Brugsch examined the bandages and separated parts of the canvas with the inscription of the rest of the bandages, he noticed that the it had alphabetic characteristics, but didn't managed to conclude which language it belonged to. He made a copy of the whole text and in his own research presented it to the German professor Rudolf Krehl. Thanks to Ljubic's catalogue and Brugsch's research the scientific community was acquainted with mummy and its wrapping. A number of foreign scientists and institutions became aware of its existence. Some of them visited Zagreb to study the mummy. Sime Ljubic released a new catalogue in 1889. with, for the first time, a detailed description of the mummy and its bandages. In October 1890, the Viennese university professor and Egyptologist Dr. Jacob Krall asked the Archaeological Department of the National Museum in Zagreb to borrow the wrappings. After a long correspondence between Zagreb and Vienna the bandages were sent to Vienna on January 19th, 1891, where they were studied for the next year. During this period, Krall discovered that the mummy bandages actually conceal the longest surviving Etruscan text in the world, written in columns. The importance of the discoveries testifies to the fact that on January 17th 1892 Emperor Franz Joseph I was informed about it. After Krall published his research and discovery an even more intensified interest in researching the bandages arose, while the mummy itself was quite neglected. From the beginning of the 20th century the wraps and the mummy have been researched intensively -> infra-red photographs were made which made further analyses of the text easier; Later, the wraps went trough a thorough reconstruction and restoration. Researching and analysing remains of papyrus that were originally shipped, readable parts of the Book of the Dead were discovered. Nesi-hensu was the wife of a tailor, Paher Hensu from Thebes, a "divine tailor" which tailored clothing for the statues of the Egyptian god Amon. More is yet to be discovered by deciphering the remaining Etruscan text from the linen, but still, the mystery encircling it and the poor knowledge of Etruscan attracts many.